“The armoured cruisers are of two classes. The first comprises the British Elswick-built Asama, Tokiwa, Idzumo, Iwate; the second the Stettin-built Yakumo, and the St. Nazaire [France]-built Azuma. These last were the original Japanese design. Elswick put the extra guns at its own discretion and rearranged the positions as the plans indicate. 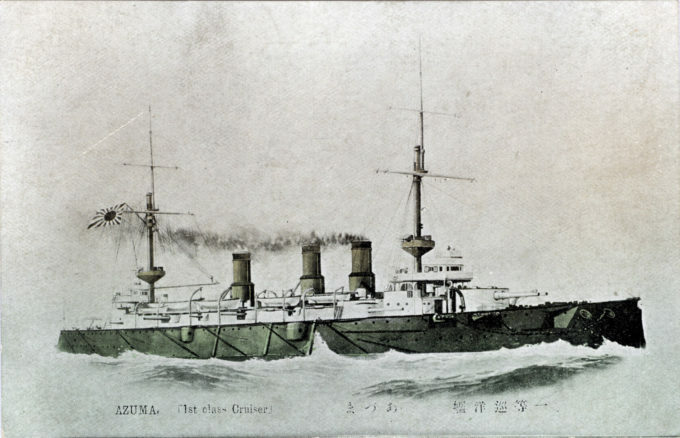 From the wiki: “Azuma – sometimes transliterated (archaically) as Adzuma – was an armored cruiser built for the Imperial Japanese Navy (IJN) in the late 1890s. She participated in most of the naval battles of the Russo-Japanese War of 1904–05 and was lightly damaged during the Battle off Ulsan and the Battle of Tsushima. Azuma saw no combat during World War I. She was never formally reclassified as a training ship although she exclusively served in that role from 1921 until she was disarmed and hulked in 1941. Azuma was badly damaged in an American carrier raid in 1945, and the hulk was subsequently scrapped in 1946. “The 1896 Naval Expansion Plan was made after the First Sino-Japanese War; in it were included four armored cruisers in addition to four more battleships, all of which had to be ordered from overseas shipyards as Japan lacked the capability to build them itself. Further consideration of the Russian building program caused the IJN to believe that the battleships ordered under the original 1896 plan would not be sufficient to counter the Imperial Russian Navy. Budgetary limitations prevented ordering more battleships and the IJN decided to expand the number of more affordable armored cruisers to be ordered from four to six ships, believing that the recent introduction of tougher Krupp cemented armor would allow them to stand in the line of battle. “The revised plan is commonly known as the “Six-Six Fleet”. The first four ships were built by Armstrong Whitworth in the United Kingdom, but the last two ships were built in Germany and France (Azuma). Unlike most of their contemporaries which were designed for commerce raiding or to defend colonies and trade routes, Azuma and her half-sisters were intended as fleet scouts and to be employed in the battleline.